Reading multiple sheet Excel workbooks into SPSS is easily done with this Custom Dialog. This tutorial demonstrates how to use it. Download and install the xlrd module. If you'd like to generate some test data as done in the syntax example, you'll need the xlwt module as well. Download and install Excel to SPSS Tool. Note that this is an SPSS custom dialog. 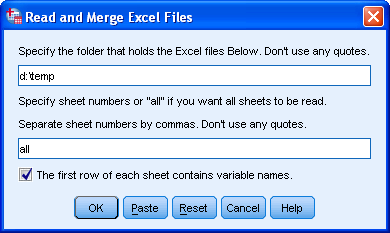 You'll now find Read and Merge Excel Files under Utilities. Close all datasets in SPSS. * Create some small Excel workbooks for testing. rdir=r'd:\temp' # Specify folder for writing test files. Since we created our test data in d:\temp, this folder will hold the Excel files. We can simply copy-paste this into the dialog. Other than that, we don't have to change anything. The first row holds the variable names and we'd like all sheets from all workbooks to be read. By default, the program will read in all .xls files in a folder specified by the user. By default, all data from all sheets will be imported. The default of all sheets can be overridden by specifying one or more sheets (see below). In order for this to make sense, all sheets in all workbooks are assumed to have similar formats (numbers of columns, column contents). By default, it is assumed that the first row of each sheet contains column names. If these conflict, the column names of the last sheet of the last workbook that's read will be used. If no column names are present, column_1, column_2 and so on will be used as variable names in SPSS. Date variables in the Excel files are not automatically converted to SPSS date variables. After reading in the data, they can be converted with the syntax below. * Convert "date" to date format. What if I Don't Want All Sheets to be Read? In this case, the desired sheets can be specified. Note that the first sheet is referenced by 1 (rather than 0). If two or more sheets are to be read, separate them with commas. If sheets that are specified do not exist in one or more workbooks, the command will not run. An error message will indicate the first workbook where this occurred. What if I Don't Want All Workbooks to be Read? This default can not be overridden. A workaround may be to move irrelevant workbooks to a different folder. That's a lot of workbooks but each one holding a single sheet renders the structure of the problem fairly simple. If you master some Python, you could use os.walk for collecting all paths to all workbooks and have SPSS loop over them and convert them to .sav files with GET TRANSLATE as pasted from SPSS menu. You could then merge these .sav files -which may require things like adjusting string lengths. I recently worked on a similar problem involving 52 inconsistently coded SPSS data files. It was a lot of work (and computing time) but still very manageable (and profitable for me as it made me 3 monthly salaries in a week). Also see Adjust String Lengths before Merging Files and Merge Many Data Files. Both are pretty outdated but they basically get the job done.